Q: Can you explain what a scale factor is? In the problem with boys and girls, why do we take 7n - 3n? A ratio problem may give us ratios and one or more absolute amounts. A ratio tells us about the ratio, but we don't know the absolute amounts. By using a scale factor, we can "convert" a ratio in absolute (I mean the actual) amounts. The ratio of boys to girls is 3/7. Great, so I know that for every 3 boys, there are seven girls. But that doesn't tell me the actual amounts I need. But I make a scale factor "n" and say the number of boys is 3n and the number of girls is 7n. Notice I have preserved the ratio. I just tagged an "n" onto the end of the numbers in the ratio. But now, these are actual amounts. While 3 and 7 were just part of the ratio of boys to girls, 3n is the actual number of boys and 7n is the actual number of girls. You may say: So what? We don't know what n is! Right! But these actual amounts 3n and 7n may be useful in setting up an equation. And if we can set up an equation and solve for n, then we know the exact number of boys and girls! There are 32 more girls than boys. "Boys + 32 = Girls"
So n = 8 is the scale factor. And know we know the girls is 7n = 7(8) = 56 and the boys is 3n = 3(8) = 24. We call it a "scale factor" because it relates the ratio to the actual numbers. A scale factor isn't the only approach or always easiest approach, but it's often a good way to work with these problems. Q: Can you explain the last problem? Why do we add the parts? The point of a ratio is to compare things using equal parts. This ratio of 1:2:3 tells me that for every 1 part of cement, I have 2 parts of sand and 3 parts of gravel. All of these parts are equal, and make up the concrete. So for every 1 part of cement, I have 5 other parts of sand and gravel, and a total of 6 parts of concrete. Why do we have 6 parts and not 1 part concrete? Well, say each part is 1 kg and we have 1 kg cement, 2 kg sand, and 3kg gravel. If we mixed these together, would we get 1 kg of concrete? No -- we have mixed together 6kg total of materials. It would not make sense to mix 6 kg of materials and end up with 1 kg of concrete. We know have a 6kg mixture of concrete. Going back to "parts," we can see that sand makes up 2 of the 6 total parts in each part concrete. We mixed 2 parts sand with other ingredients to get 6 parts concrete. For some positive integer, n, we definitely have 3n and 4n girls. We can definitely say that if we're given a 3 to 4 ratio. Here n sometimes is called the scale factor, notice if we're given once again, if we're given a ratio 3 to 4 we have no idea about the absolute size of the other group, that's a big idea to which we'll return. There are many different ways of presenting ratio information. The first, I'll call it p to q form. The ratio of boys to girls is 3 to 4. We just spell it out, literally, like that. Second is fraction form, the ratio of boys to girls is 3/4. We can write it as a fraction. Third is colon form. This is very common on the test. The ratio of boys to girls. We read this as three to four. But it's written with a colon. And then finally, a tricky one, I'll call this idiom form. For every three boys, there are four girls. So that's an idiomatic way in english. To say exactly the same thing, all four of these contain exactly the same information. Now, of course, of these four forms, the most useful by far is fraction form, because when we rewrite the fraction in. 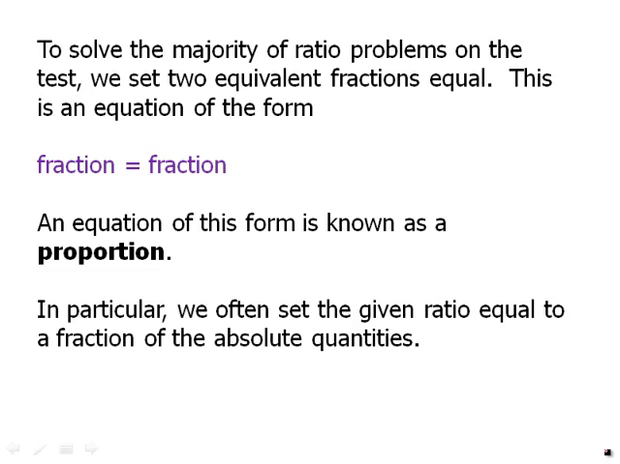 To solve the majority of ratio problems on the test, we set two equivalent fractions equal. This is an equation of the form fraction equals fraction. An equation of this form is known as a proportion. And if you're not familiar with the mathematics of proportions, you are allowed to do one. You're not allowed to do with proportions. I highly recommend you watch the video Operations with Proportions. In particular, we often set the given ratio. The ratio given in the problem equal to a fraction of the absolute quantities. For example, here's a practice problem. In a class, the ratio of boys to girls is 5 to 8. If there are 40 girls, how many boys are there? So I'm gonna suggest, pause the video here and work this out on your own. I will say, this is probably a simpler problem. Probably, this is a little too simple by itself to be a test problem. But, this field could be part of a larger problem. This definitely could be a piece that you'd have to figure out as part of solving a larger test problem. So, what I'll say is we solve by re-writing the ratios in fraction form and setting up equivalent fractions. So one fraction, of course, is five over eight, that's given, and that's a ratio of boys over girls. So I have to make another fraction of the form boys over girls. I have an e, an expression, I have a number for the girls, 40. So I'm gonna have to say that the number of boys is x, so that fraction would be x over 40, boys over girls. So, x over 40 boys over girls, equals 5 over 8 boys over girls, makes sure that both fractions, the numerators and denominators represent the same things. Well, in this particular proportion, I notice there's a multiple of 8 in both the denominators. So you can cancel that multiple of eight, with what we call horizontal cancellation, once I've done that then I'm free to cross multiply I get x equals 25 which tells me that there are 25 boys in the class. Here's another one, in a class the ratio of boys to girls is three to seven, if there are 32 more girls than boys. How many boys are there? So again, I'll recommend pause the video, see if you can work this out on your own, and then I'll show the solution. Now some people may be tempted to use algebra to solve this. So, for example, one could assign variables. B is the number of boys, G is the number of girls. We could set up two equations, B over G equals 3 over 7, G minus B equals 32. We have two equations with two unknowns. We would be able to use algebraic techniques to solve this, but that would very, very long and time consuming. So I would not recommend that particular approach. Instead, I'm going to show something much simpler. I'll just point out ratio information often allows for a number of elegant short cuts. Here I'm going to say let's rewrite the given information in terms of scale factor. The fact that we have a ratio three to seven means we could say the number of boys is 3n. The number of girls is 7n. We don't know what n is; but in other words, we can rewrite this in terms of n. Well then, it's very clear that the difference 7n minus 3n is 4n. 4n equals 32. Well, immediately we can. Then solve for n, and then solve for the number of boys. So that's a much more elegant solution. Scale factor is the magical link between ratio information and information about full quantities. This is a powerful short cut about which to know. So far, we have talked only about ratios among the parts,. Assume we have moe than enough cement and gravel. So, again I'll say pause the video and see if you can solve this on your own. So the first thing I'll do to solve this, is think about proportions. We want to relate sand the part to concrete the whole. So there's 1 plus 2 plus 3 parts. That's 6 parts in the whole. So some, so sand to whole is 2 to 6. Sand to concrete is 2 to 6 and we can simplify that as 1 to 3. Sand accounts for one-third of the total weight of the concrete. So now, we can set up our proportion. We have the fraction 1/3, and we can set that up to sand, which is 150 kilograms over x, the number of kilograms of concrete that we don't know. We cross multiply and we get 450, so we can make 450 kilograms of concrete given 150 kilograms of sand. In summary we talked about ratios and a little bit about what they means and what they don't mean. In particular, they don't mean anything about the absolute size, the absolute quantities.